It was dark. Silence reigned Mecca. It was time for every one to sleep, to close eyes and get power for the day after. And Prophet Mohammad (S.A.W.) was no exception. He wanted to take some rest after pray. But he heard a familiar voice. Yes, it was the voice of Gabriel, the Messenger Angel. The angel told Prophet Mohammad (S.A.W.) that he would have a journey on the same night which himself would accompany the prophet to show him the universe, with the help of a transport called Burraaq, an animal unique in creation. Prophet Mohammad (S.A.W.) started his majestic journey from the house of his sister, Um Hani, and departed for Mosque Al-Aqsa in Jerusalem. In no time he descended on the mosque to pay a visit to it as well as to Bethlehem, the birth place of Jesus, and to other holy places. Here, he started the second part of his journey. He ascended to heavens, saw the universe, talked to angels and prophets, visited hell and paradise and came to know of the secrets of the universe. He descended on Jerusalem at the end and flew back to Mecca. On his way back to home he encountered a trade caravan from Quraish searching for a missing camel. He drank water from their jar, returned to Mecca before dawn. He descended from his transport in Um Hani’s house and she was the first person that he informed about his majestic journey. In the same day he let circles of Quraish in on what happened. Consequently the impossible journey was talk of the town and that made the heads angry more than ever. 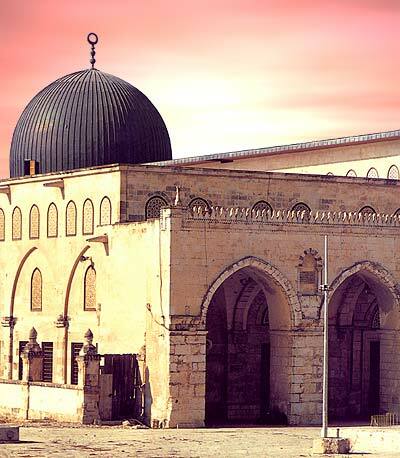 Like before, Quraish started denying Prophet Mohammad’s declaration and said: there are few people in Mecca who saw Jerusalem, describe to them the city. Prophet Mohammad (S.A.W.) 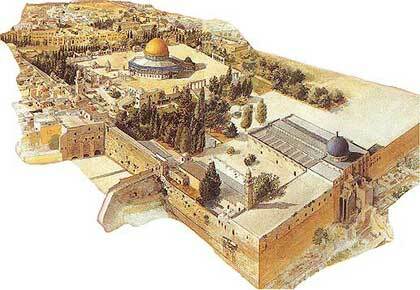 described in details not only the city but also all what he saw between Mecca and Jerusalem. He said: on my way I encountered a trade caravan who had lost a camel. Between their belongings there was a jar of water which I drank from and replaced its cover. In another spot I saw a group of people whose camel was startled and broke his leg. Quraish said: tell us more about the caravan of Quraish. He replied: I saw them while led by a gray camel with a howdah on it. The caravan will enter Mecca shortly.